(XL) Mens Vintage 70s Pullover Disco Shirt! 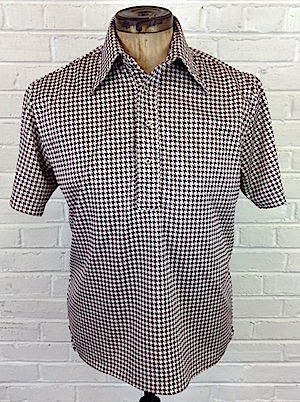 Funky White & Brown Houndstooth! Home > Items just added 4/3-4/17 > (XL) Mens Vintage 70s Pullover Disco Shirt! Funky White & Brown Houndstooth! Mens vintage 1970s pullover disco shirt. 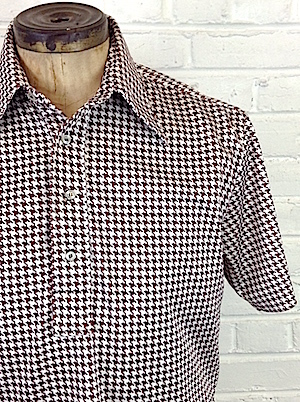 Groovy white and brown houndstooth pullover shirt! Has a super wide & pointy disco era collar with an opening that is secured with pearly white buttons just below. Tagged by Izod. 100% Polyester. .